It would figure that the first time a girl wanted to talk to him, he'd knock her flat.3.5 stars. Aww...it's wittle Hunter. You read that correct. I didn't do a typo there. I wrote "wittle" as in "want to pinch your cheeks because you're so adorable" Hunter. Even though I think this story took place right before he moved to the place he was living at during the book Storm, he seems so young and clueless in this previous life. When did you get your confidence mojo, Hunter? I had no clue that you were so afraid of girls in the past. I guess that's one of the bonuses of getting these little short stories in between books. We get to catch glimpses of the "before" in the characters' lives. This was a quickie read (42 ebook pages), so there's not much to review or talk about other than Hunter is a BADASS, even if he looks like he should be in a boy band on this craptastic cover (he will always be the infamous "come with me to heaven" boy in the band). If you'd like to know more about why I'm loving this series, you can read the reasons HERE. Fearless wasn't nearly as crazy as Michael's short story Elemental, but I'm still happy to have gotten some perspective on Hunter. I will take any crumb when it comes to learning more about the elemental world. This is probably going to end up being one of my favorite series because I've loved everything I've read so far. 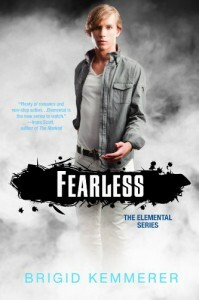 I'd wait to read Fearless until after you've read Elemental and Storm, but if you can, try to fit this in before you get to book 2. Not that you have to because it's an extra, but hey...why not, right? Anyway, I swear, I'm not even trying to lazy review here, but it's too short to say much about! In a nutshell : these books are a fresh take on the tired and overdone pnr genre. I highly recommend that you skip right past the overly hyped pnr stuff that's out there and try this fun series instead!